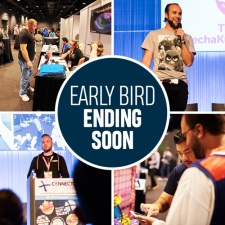 You have just days left to save up to $400 on the price of tickets to January’s Pocket Gamer Connects London 2019. Early Bird prices end at midnight Thursday, November 29th, so don’t hang about and book now! Part of an international series of B2B events for the games industry, Pocket Gamer Connects was first held in London in 2014 and is now the biggest exhibition and conference of its type in Europe. The show will attract over 2,500 delegates from all around the world, including Europe, Asia and America. As well as a vibrant expo space, a star-studded conference schedule features 16 seminar tracks across both days of January 21st and 22nd, delivered by more than 160 world-class speakers covering mobile games, handheld consoles, and VR and AR. You can find out more about some of the amazing speakers here, here and here. Making a welcome return for 2019, PC Connects London brings a further five seminar tracks, while Blockchain Gamer Connects makes its UK debut with four more tracks. Your ticket will get you into all three shows and all 25 conference tracks. Network, do business - and party! No other event puts you in touch with the entire mobile gaming industry like Pocket Gamer Connects. From our online Pitch & Match meeting scheduler - free to all delegates - to the SpeedMatch sessions that pair developers with publishers and investors in a series of speed-dating style meetings, PG Connects is all about helping you make the connections that are crucial for your business. And we couldn’t leave without mentioning the tempting prospect of a free bar, finger food, music and dancing at the Global Connects party until late on Monday night. With both beer and prospects on tap, the party alone is worth the price of admission - and that’s never more true than with our Early Bird prices. Book your place before the Early Bird prices end on Thursday to get up to 20% off the price of your tickets and save up to $400 - book now!